The former Lear House and Surgery, built for Dr Darcy C. Lear at 572 Plenty Road. It was designed by architect Harold Desbrowe-Annear and built 1932-33, just prior to the architect's death in June 1933. 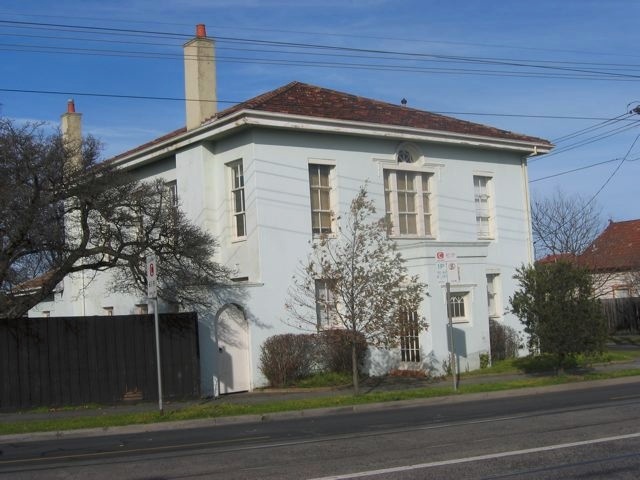 It is a substantial two-storey building, which fronts the two streets of its corner site with minimal setbacks and no fence between the footpath and house. It steps down to a single storey wing at the rear, along the Josephine Grove frontage.The house is designed in the Georgian Revival style, and exhibits common features of this type, including its rectilinear massing, formal and symmetrical facades, use of a Palladian window above an entrance porch and Adamesque detail to the exterior and interiors, and Desbrowe-Annear's signature three-sash French windows with a fixed bottom sash to exclude dust and flies. The former uses of the building are indicated by the two entrances. On Plenty Road is a flat-roof entrance porch. Above the doorway is a Rod of Asclepius, indicating a medical use. The residential entry off Josephine Grove is recessive, located within a recessed porch which can be closed off with sliding screen doors. Mail and milk deliveries could be made directly to the kitchen on this side, through timber hatches which survive. The interior is highly intact and retains more features typical of Desbrowe-Annear's town houses, including plaster moulding panels to the walls and Adamesque mantelpieces. Other elements have a clear relationship with his earlier Arts & Crafts designs, including the diagonal geometry of the entrance hall, the timber staircase, and the 1st floor fireplace with a salt-glazed tile mantelpiece and hearth. At the east end of the Josephine Grove frontage is a two-car garage, designed by Desbrowe-Annear in the same manner as his widely publicised 'Week-End House' plans of which were published in 1922. It has an external timber frame with cross-bracing, and an internal fibro-concrete lining which is visible from the outside. The garage retains one of two original folding ledged garage doors. 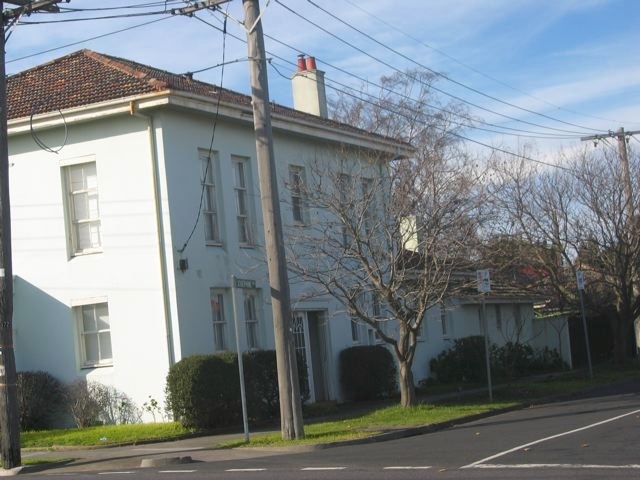 The former Lear House and Surgery and garageat 572 Plenty Road, Preston is of local historic and architectural significance to Darebin City. The former Lear House and Surgery is situated on the northeast corner of Plenty Road and Josephine Grove, Preston. It is a substantial two-storey building, erected on a slight diagonal to Plenty Road so that its facade faces due west, but parallel to its Josephine Grove boundary. The house has a very small setback from its two street frontages and there is no fence between the building and the footpath. The house largely delineates the street boundary, continued on the south side by a single-storey wing. 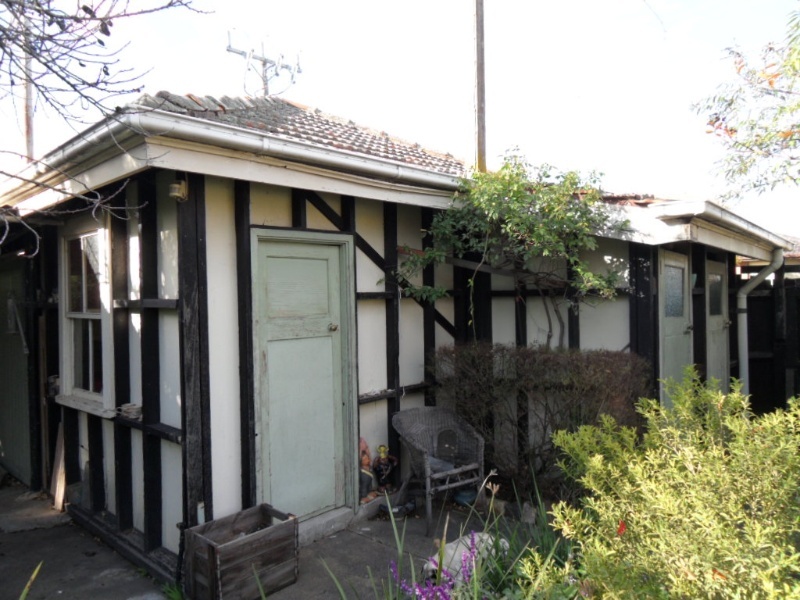 At the rear of the Josephine Grove frontage is a double garage. The garden is entered from Plenty Road via an arched gateway in a high rendered wall. The extent of the wall indicates the original size of the garden on the north side of the house, before it was enlarged in 1939. The main volume of the house is two-storey with a hipped roof covered in varicoloured terracotta tiles. The wide eaves are lined with timber battens. The three chimneys are simple, rendered and rectangular with a narrow band of moulding at the top. The facade, facing Plenty Road, is symmetrical with an enclosed entrance porch at the centre with canted sides, above which is a Palladian window (tall round-headed window between lower rectangular windows, also called a Venetian or Serlian window). These central features are flanked by sash windows: small two-over-two double-hung sash windows affording privacy to the interior, and three-sash French windows to the first floor. 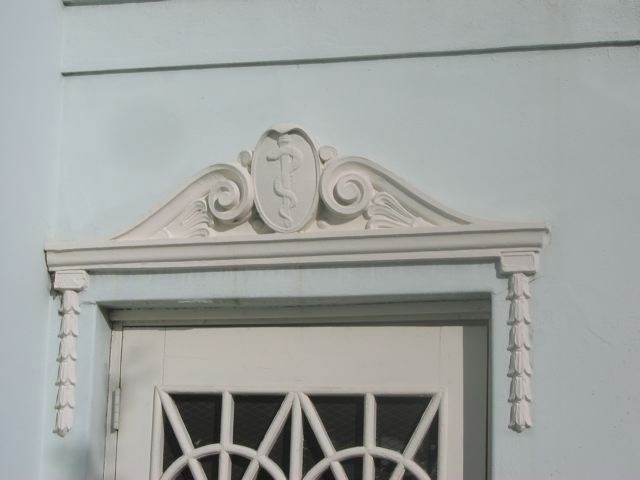 Above the entry door is a scrolled broken pediment with a Staff of Asclepius (serpent around a rod), indicating the medical use of the surgery. The south elevation, facing Josephine Grove, is devoted to residential use. Again, the two-storey mass has a symmetrical arrangement with the entrance at the centre, above which is a small window. At the ground floor, the entrance is flanked by pairs of small two-over-two windows with high sills to afford privacy in such close proximity to the footpath. At the first floor level, pairs of the three-sash French windows are used. The door to the house is within a recessed porch which can be enclosed with the original sliding screen doors. The door itself is heavy, varnished timber with a single panel and an automatic closer. The house steps down to a single-storey hipped section (over the dining room and part of the lounge) which extends the entire width of the house, then narrows to a lower service wing situated along the Josephine Grove boundary. These rear wings are finished in the same render finish and the same tiled roof. Windows are smaller and simpler. Most of the windows on the north elevation, facing the garden, are the three-sash French windows. On the rear (east) elevation are the same French windows to the ground floor, and two-over-two sash and fixed circular windows to the first floor, arranged symmetrically around the high hip roof of the rear wing. The ornamentation of the building is restrained, and limited to a small amount of moulded applied ornament in the Adamesque style - floral garlands at the corners of door and window entablatures, and scrolled broken pediments over the surgery and residence entry doors. An unusual Adamesque element, and a rare survivor, are the window and door screens with a radiating fanlight motif. These are seen on the windows to the surgery porch, and on screen doors to the surgery entry, residential entry and back door. The Palladian window on the facade also has a Adamesque fanlight. Another unusual detail are the mail and milk delivery hatches in the kitchen wall (south elevation). Internal features of the house that are characteristic of Desbrowe-Annear's oeuvre or otherwise unusual are: the ground-floor plan radiating out from the central hallway with angled walls to allow access to more rooms, the Arts & Crafts timber staircase, Adamesque plaster wall panelling and mantelpieces in Lounge and Dining Room, sliding doors between Lounge and Dining Room, salt-glazed tiles to all ground-floor hearths, fireplace with tiled mantel and hearth (1st floor), and built-in wardrobes in a 1st floor bedroom. Internal features of the house that are typical of its era and intact are: the electric call-bell system, kitchen cabinetry, doors and brass hardware, bathroom fittings and fixtures in rear wing, two-tone terrazzo floor and toilet roll holder in 1st floor bathroom. The house is highly intact externally and internally. The only alterations noted externally is the replacement of the garden gate onto Plenty Road, overpainting of the original cream limewash with a modern paint (though two chimneys have not been overpainted), installation of a new mail slot, removal of a wall-mounted lamp on the west face of the surgery porch, and removal of the scotia moulding beneath the gutters. Internally, some fireplace openings have been covered over or infilled with a heater, a new parquet floor was installed in the dining room (most other floors are carpeted and could not be seen), and there are modern fixtures and appliances in the kitchen. The garage, at the rear of the site, has a slight setback from Josephine Street, and two large garage doors, one of which is the original folding ledged door. The hip roof is covered in terracotta tiles, and extends to a narrow skillion on the west side. Here the construction of the building is visible from the street: an external timber frame with cross-bracing with the internal fibro-cement lining exposed. From within the garden, the rest of this structure is visible. The timber members are painted with a matte, black finish, possibly Tarsene tar-based paint. Doors into the skillion section are high-waisted, typical of the interwar period. The garage is intact apart from replacement of one of the garage doors with a modern roller door.